According to records that date all the way back to 1689, the property that is now the Ipswich Inn has been the site of multiples houses. It was originally a brick home owned by Mr. Thomas Bracy, who sold the property to Robert Paine, 'Elder to ye church of Ipswich.' As reported by the records, he was a man foremost in zeal for the educational advancement of the community. In 1689, Mr. Paine passed possession of his mansion and three acres of land, with orchard, garden, etc., to his son Robert Paine Jr., Feb. 12, 1689 (IPS. Deeds 5:590). A year later, the property which consisted of and two and three quarter’s acres, was sold to Mr. Francis Wainwright, Sept. 30, 1690 (Ips. Deeds 5:326.) The Wainwrights were a famous family --- Francis, the immigrant, served with great distinction in the Pequot war in his young manhood. He became a prosperous merchant and prominent citizen. He died on May 19, 1692. His son, also named Francis, graduated from Harvard College in 1686. He was the Colonel of a regiment, Town Clerk, Representative in General Court, Feoffee and Justice of the General Sessions Court. He died on Aug. 3, 1711. In the forty-eighth year of his age In 1740, the property was again sold to Capt. Thomas Staniford. Capt Staniford, according to the records, was a “gentlemen” who occupied the house until his death on Feb 28, 1740. His will was filed Sept. 7, 1778 (Pro. Rec. 353: 206), and the inventory of his estate, filed Dec. 9, 1778 (353: 316) reveals the furnishings of one of the fine mansions of the Revolutionary period, at the inflated values that prevailed at that time. Some items are of interest, which specifies the wardrobe of a gentleman of that day and various articles of furniture. The son of Capt Thomas Staniford was also a Captain and his name was James. Capt. James Staniford occupied the mansion, which is often alluded to as the "old brick," because it had brick ends, and kept an inn. He also purchased of Richard Dummer Jewett an undivided half of five and three quarter’s acres of the land adjoining, May 28, 1803 (172: 178). The heirs of James Staniford and his son James sold "the brick house" and eight and a half acres to Dr. Thomas Manning, June 10, 1830 (259: 76). Dr. Manning sold "the old brick" to his son, Dr. Joseph Manning of Charleston, S. C., Dec. 27, 1830 (266: 73) and he passed it on to John Jewett, Dec. 9, 1835 (290: 121). 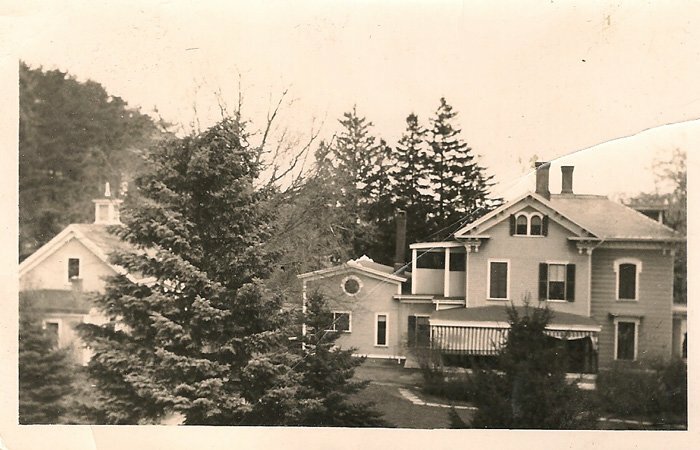 Mr. Jewett tore down the old mansion, which was still in excellent preservation, and built on its site the brick dwelling, which was purchased a few years ago and torn down by Mr. John B. Brown and Mr. Harry B. Brown. The property passed through several more families and eventually was owned by Susanna Wilcomb on March 27, 1814, who sold her lot to the trustees of the Methodist Episcopal Church. A meeting house was then built on this property and used by the church until the present church was built. 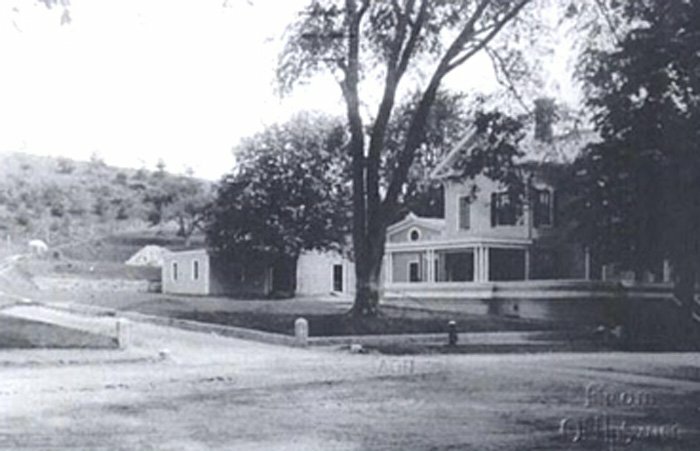 The lot was then sold by the trustees of the Methodist Episcopal Church to Robert Jordan on May 17, 1862. Robert Jordan was a Civil War veteran who made his living as a general merchant after the war. Mr. Jordan built this house in April of 1863. 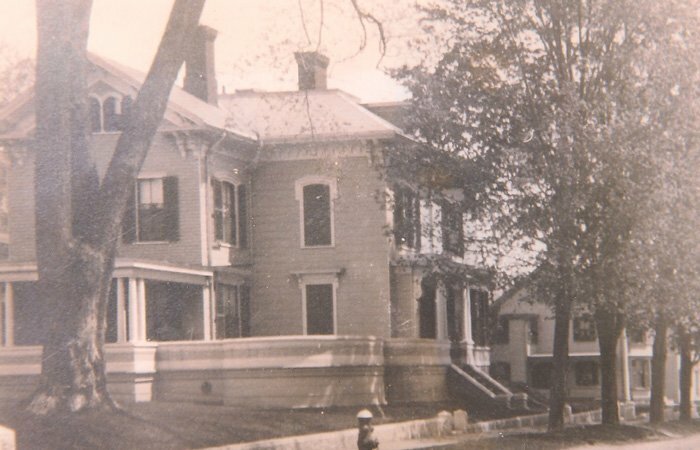 Years later, the house was owned by Dr. Bailey, a local physician, who treated his patients in his office which was at the rear of the house. The Robert Jordan house is a fine example of an Italianate-style Victorian, situated on an acre of land in the center of historic Ipswich. The rear of the property features terraced land which was developed growing mulberry bushes for the silkworm/silk industry which flourished in Ipswich in the early 1800s. Interesting architectural features of the house include the Belvedere on the third-floor roof, the curved front stairway, original ceiling moldings, and the ice house at the rear of the main house, which was part of the “summer kitchen”. The carriage house is at the back of the property. Margaret and I bought this house in 1996. We had been on Pleasant Street for twenty-two years, and after our three kids grew up got married, Margaret decided we needed more room. A bed and breakfast was not in our plans but we began to think of the fun it would be meeting new people, and sharing our home with strangers that wanted to pay us for being here (a no-brainer). So, out of those thoughts and dreams, came our B&B, which grew to become The Ipswich Inn. This is our 20th year. All we wanted and wished for has come true. This has been a great adventure that continues to bring more and more people into our lives that have become friends. We truly hope your stay with us and your meal will be as pleasant and restful as the joy we have in bringing it to you.